This past November, I celebrated a milestone birthday. While I don’t especially love the fact that I have hit this milestone, I did have fun celebrating with family and friends by hiring a chef to cater an in-home cocktail party featuring a variety of delectable appetizers. Each time I celebrate a birthday, I think about this sentiment: “Add life to your years, not years to your life.” I use this as a guidepost in my life because it represents a beacon of hope for a bright and positive future. It helps me reframe how I think about having yet another birthday, but more importantly, it reminds me that, like a fine wine, I can get better with age. It has been said that a woman should never reveal her age so I'll leave that to your imagination. However, this year, PEN® will reach a milestone. We are shouting out loud and proud that PEN® turns 10 years old this September! In lead up to this PEN@10 milestone, we have created a PEN® Community webpage where we launch our storyboard video which shares our story of how we have grown to become a global resource for nutrition practice. What did we look like 10 years ago? We will post PEN® archives so you can see how PEN® has grown and developed. We will also share stories of how dietitians have been impacted by evidence-based dietetic practice. We are proud of the “life” we have added to our years, and hope you will join us in celebrating this PEN@10 milestone birthday. In this issue of PEN eNews 4(5), we showcase examples of how dietitians are translating evidence-based recommendations into practical guidance. Are plant-based beverages suitable for infants? describes recently published data on infants consuming plant-based beverages and outlines when these beverages can be safely introduced. 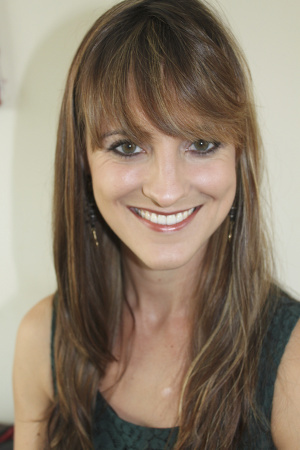 Using evidence to answer popular questions - all in a days work as a media spokesperson profiles UK dietitian Gemma Sampson (formerly Critchley) and her advice for dietitians engaging in media relations. Australia’s Healthy Weight Week profiles dietitians as the experts in weight loss and healthy eating advice highlights an exciting advocacy campaign occurring this month, including new factsheets, a cookbook, social media toolkit and a Twitter Chat. All this and more in eNews 4(5). Welkom! The PEN® Global team would like to welcome the Association for Dietetics in South Africa in joining the Practice-based Evidence in Nutrition® Community! 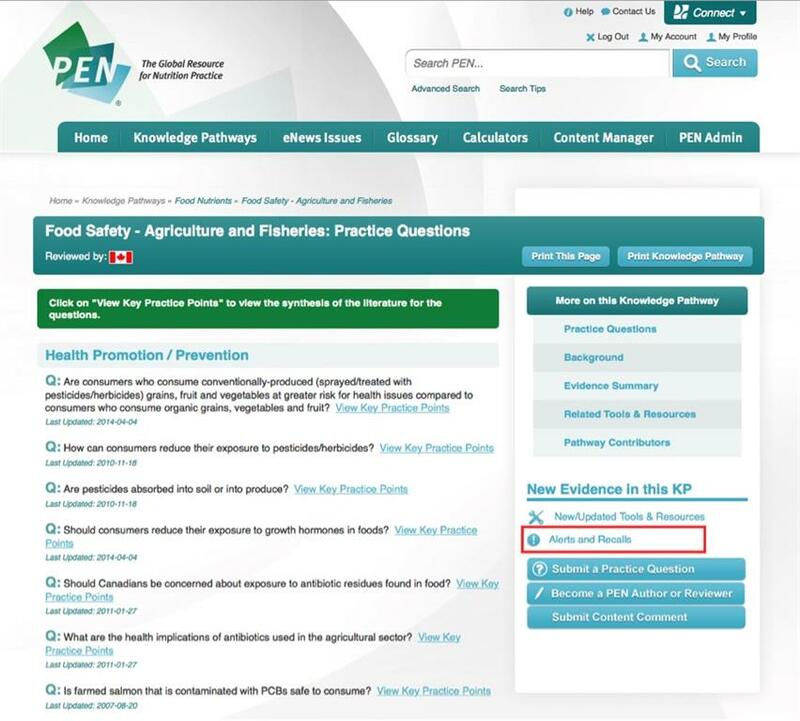 We encourage you to explore PEN® and hope that you find it valuable to your dietetic practice! We look forward to working with South Africa’s dietitians to expand the PEN® knowledge database, making it the “go to” resource to support evidence-based dietetic practice. 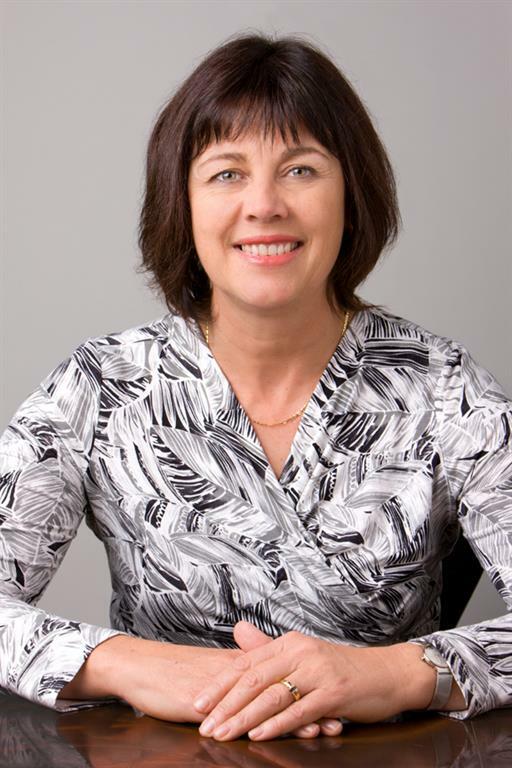 The Dietitians Association of Australia (DAA) is extremely proud of one of our esteemed members, Professor Linda Tapsell AM who was announced as a Member of the Order of Australia (AM) on Australia Day, 26 January 2015. Linda received the AM for her outstanding service and dedication to Australian Nutrition and Dietetics; in dietetic education and training, the development of professional competency standards, basic and applied nutrition and dietetic research, national nutrition policy development and publication and editorial leadership. She spent the first 14 years of her career in hospital clinics and public health before she moved into research, where she has written more than 200 scientific publications while editing journals and chairing various research committees. Linda was appointed a Fellow of DAA in 2005 and previously received an Outstanding Contribution Award. In 2012 she was awarded Honorary Life Membership of DAA. To receive an AM is a wonderful achievement and well-deserved. “I was not expecting this, but then I thought of the privilege and how kind people can be. This is a real honour and I am very grateful for the recognition” said Linda. DAA was delighted to make the nomination and congratulates Linda! What impact does obesity have on physical function and psychosocial health (e.g. quality of life) in adults, adolescents and children with spinal cord injury (SCI)? What are the best practices for the effective implementation of cooking and food skills training programs/interventions? What enablers and barriers need to be addressed to promote food preparation involvement? Do individuals with chronic obstructive pulmonary disease (COPD) benefit from antioxidant nutrients to combat increased oxidative stress? Are elderly individuals who consume folic acid-fortified foods or take folic acid supplements at greater risk of developing vitamin B12 deficiency? Commentaries to this story making headlines: Evidence from randomized controlled trials did not support the introduction of dietary fat guidelines in 1977 and 1983: a systematic review and meta-analysis. Global Nutrition Report: State of the world's nutrition and the progress in combating malnutrition. Recommendations from the Canadian Task Force on Preventive Health Care, led by Dr. Paula Brauer, PhD, RD, FDC, for Prevention of Weight Gain and Use of Behavioural and Pharmacological Interventions to Manage Overweight and Obesity in Adults in Primary Care published in an early release in the CMAJ. 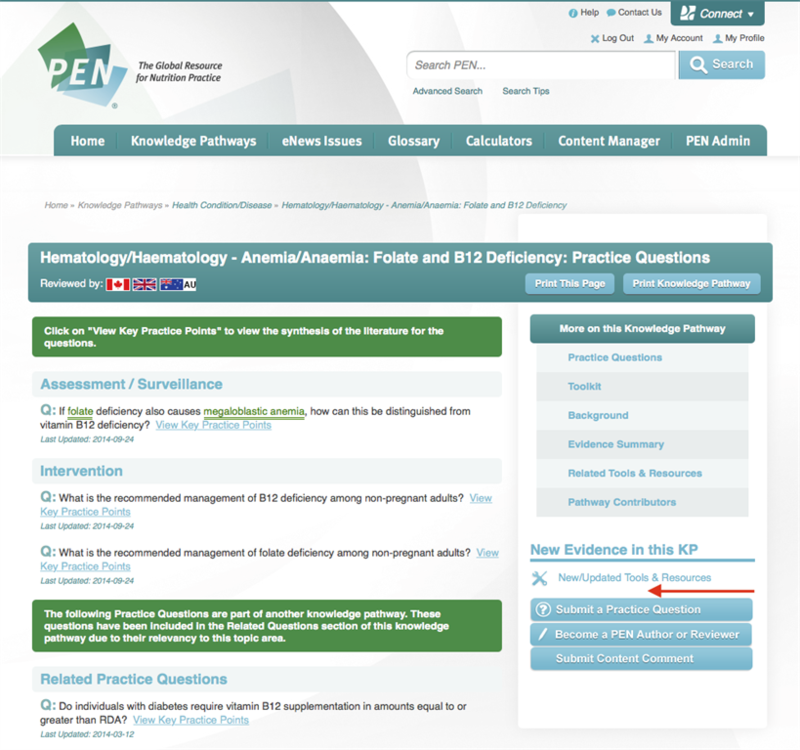 Have access to the PEN® knowledge database, but need help with how to use PEN® more efficiently? Join our 60-minute webinar where we will demonstrate 10 key PEN® tips and tools that will help you use PEN® more efficiently including how to search the PEN® knowledge database. Get back into PEN® to make the most of your PEN® access. See how PEN® can help support you as the most credible source of nutrition information. Sign up for our Webinar today. Space is limited. If you would like to learn more about the PEN® knowledge database, watch our PEN® storyboard video. *Not a PEN® Subscriber? Get a 2 week free trial at www.PENnutrition.com! 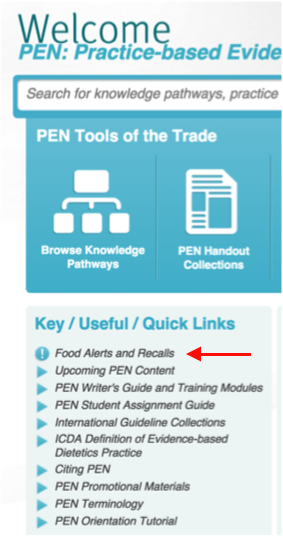 How do I…find alerts on PEN®? Click on the Food Alerts and Recalls link, and this will you to government links for recalls from Australia, Canada, New Zealand and the U.K. 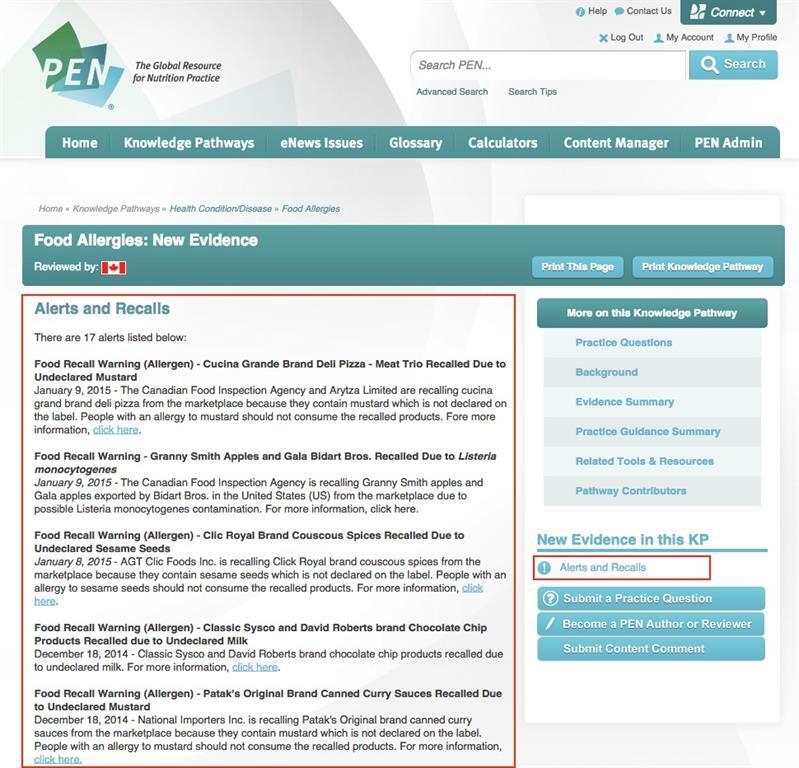 The PEN® Team receives the Canadian alerts from the Canadian Food Inspection Agency (CFIA) and immediately posts nationwide alerts on the website to warn users about items to be aware of. We are evaluating the process for adding nationwide alerts from our partner countries. Each notification is placed in the specific Knowledge Pathway that it relates to. For example, if an alert involved undeclared peanuts being in a certain food product, that alert would appear in the Food Allergies Knowledge Pathway. The Alerts and Recalls notification label automatically appears in the right hand menu bar if there are any alerts listed. If there are no alerts in that Knowledge Pathway, “Alerts and Recalls” does not show up in the right hand menu bar. When you click on “Alerts and Recalls”, you will be shown a screen that lists alerts and recalls relevant to a certain Knowledge Pathway. For example, the screenshot below lists alerts and recalls about Salmonella contamination and spoilage. These are issues around foodborne illness and are in the Food Safety – Foodborne Illness Knowledge Pathway. Some Knowledge Pathways tend to have more alerts and recalls compared to others. For example, the Food Allergies and Food Safety Knowledge Pathways usually have several alerts listed at any given time. This is because a lot of alerts tend to be related to undeclared allergens in packaged foods, concerns around foodborne illness or foreign materials appearing in food products. The notifications are kept on the PEN® Knowledge Pathway for three months and then are deleted. The notifications are not archived. We hope that you find this information useful. 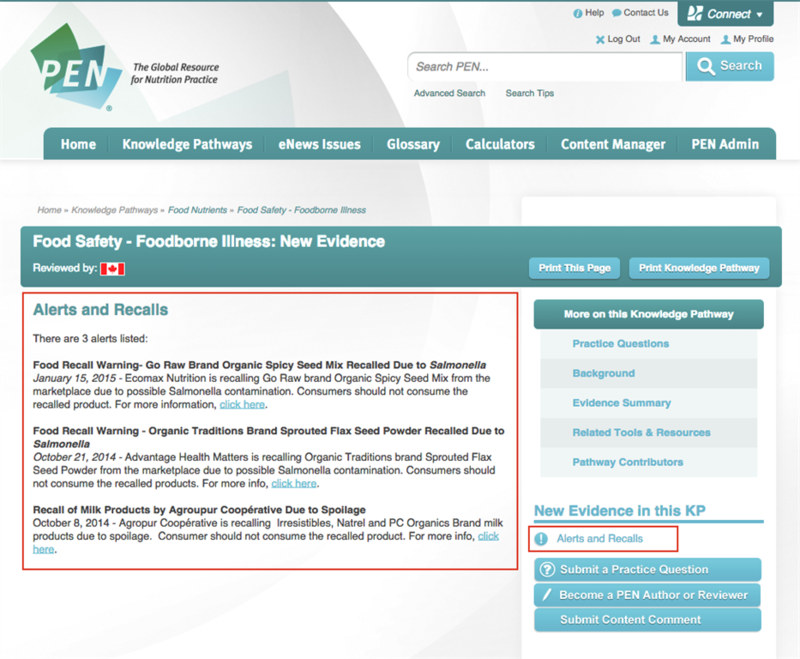 Be sure to check the Alerts and Recalls section in a Knowledge Pathway for timely updates. Australia: sign up for email notifications from Food Standards Australia New Zealand. Canada: sign up for email notifications from the Canadian Food Inspection Agency website. How often can you eat chocolate? Is birch water the next coconut water? Should everyone be eating Paleo? How can you make Christmas healthier? These are typical questions circulated amongst the British Dietetic Association (BDA) media spokesperson team waiting for comment from a dietitian. Being involved in media relations is time-consuming - why do you do it? It’s fun! I’ve found that being a media spokesperson really challenges me to stay up-to-date with current nutrition trends, what’s popular and what people are eating and talking about. It’s a good way to stay on my toes as well ensuring my practice is up-to-date. Plus, all that research into the health benefits of the latest ‘superfood’ counts towards continuing professional development (CPD). What advice do you have for dietitians engaging in media relations? Establishing strong relationships with journalists are important, because if you are reliable and can provide accurate information within a timely manner they are likely to ask you again. I’ve been approached a number of times this year by freelance journalists working on behalf of leading UK women’s magazines and Tesco Living to comment on pieces they are working with. It doesn’t always end up in print, but it’s establishing those relationships that are important. If they aren’t getting advice from dietitians, they will ask someone else. 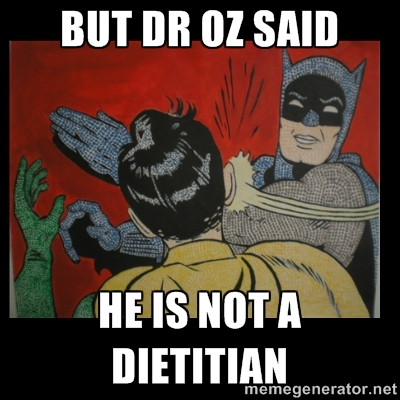 On a positive note I’m discovering that a number of journalists are actively seeking dietitian out and are now looking for nutrition advice that has solid scientific evidence behind it which is very reassuring. How do you create a message that is evidence-based while also media-friendly? One of the first things I do when I have a media request is to check whether there are any reviews on PEN® relating to the topic of interest. The knowledge pathways and questions are great for quickly finding high quality research on a given topic that can form the basis of my message. I’ll always have key points that I aim to get across with research & references to back them up (if asked). The BDA Food Facts are also great resources and tools to refer to. Getting straight to the point is key, but doing so in an interesting an engaging way that is approachable and realistic. Knowing your target audience is also important, as that will influence your language and the phrases you might use during an interview or within comments. If it’s a phone interview I’ll also prepare notes on related topics as there is a tendency to get thrown curve balls to try to catch you off guard. Why do you think it’s important for dietitians to be active within the media? We live in a media-savvy society where people turn to Google and online bloggers for their standard nutrition and health advice. Many people are still unsure of the differences between dietitians, nutritionists or nutrition experts leaving wide gaps in the quality of information out there. By getting involved as dietitians on social media and engaging with journalists and media in all its formats we can further promote our profession and address inaccurate advice. If you are thinking of getting involved in social media, there are some great resources with the BDA, or DAA on dietitians within social media, within PEN on social media and media relations as well as regular training workshops which I’d thoroughly recommend. Are plant-based beverages suitable for infants? While there is evidence that eating more plant foods is of benefit to our health, the trend for consuming plant-based beverages has recently highlighted concerns of feeding these beverages to infants and young children. A recent article published in the Canadian Medical Association Journal reports that in Canada “children who drank only non-cow's milk were more than twice as likely as children who drank only cow's milk to have a 25-hydroxyvitamin D level below 50 nmol/L” (1). Low blood levels of vitamin D are only part of the story. Plant-based beverages are generally lower in fat, protein, and some vitamins and minerals compared to whole cow’s milk and infant formulas (2,3). In addition, samples of rice beverage have been found to contain high levels of arsenic. Some soy and rice beverages have amounts of manganese that increase the risk of adverse neurological effects if these beverages are consumed by infants as the sole source of nutrition. There have been reports of kwashiorkor and rickets in infants fed rice, soy or nut beverages (2), including one death in a 2.5 month-old infant secondary to hyponatremia and respiratory acidosis (4). While some plant-based beverages are fortified with additional nutrients, the amount of nutrients added varies between products. Even after supplementation, most of these beverages are not nutritionally equivalent to cow’s milk. For example, the amount of protein in whole cow’s milk is 3.2 g/100 g compared to 0.2 g, 0.4 g, and 2.6 g/100 g of enriched rice, almond and enriched soy beverages, respectively (2). A chart detailing the nutritional breakdown of whole cow’s milk, almond beverage, and enriched soy and rice beverages is found on PEN® here. Plant-based beverages such as rice, soy, hemp, flax, oat, or nut (e.g. almond, chestnut, coconut, cashew) are not recommended as the main milk source or as a replacement for breastmilk, infant formula or whole cow’s milk for children for the first year of life. Breastmilk is the best option for the first six months and breastfeeding can continue for two years and beyond. When breastfeeding is not an option, infant formula should be given. After 12 months of age and under the supervision of a health care professional, fortified soy drink or calcium-enriched, full fat rice or oat drinks may be introduced (5). Alternative sources of protein and B12 should be added to the diet. After two years of age, soy, rice, almond and coconut beverages may be introduced (6). After six months of age, full fat, fortified, unflavoured soy can be given as an occasional complementary food. For toddlers, plant-based beverages fortified and supplemented with vitamin D, B12, riboflavin and calcium may be provided (7). After 12 months of age, full fat, fortified, unsweetened soy beverage may be given as part of a good, mixed diet (8). Rice milk is not recommended for toddlers and young children due to the potentially high levels of arsenic (8). Dietitians need to be aware of the recommendations and nutritional content of local plant-based beverages to provide guidance to parents and caregivers whom may be giving these drinks to infants, toddlers and young children. Infant Milks in the U.K.
Dietitians of Canada. What are the recommendations for the use of plant-based beverages (e.g. soy, rice, almond, coconut and oat milk/beverage) during the complementary feeding period in infants? In: PEN: Practice-based Evidence in Nutrition®. 2014 Apr 25 [cited 2015 Jan 7]. Available from: http://www.pennutrition.com. Access only by subscription. Free trials available. Click Subscribe on log in page. Dietitians of Canada. What types of formulas are suitable for formula-fed infants and for what duration? In: PEN: Practice-based Evidence in Nutrition®. 2014 Apr 25 [cited 2015 Jan 14]. Available from: http://www.pennutrition.com. Access only by subscription. Free trials available. Click Subscribe on log in page. The education the girls receive through our exchange program goes beyond the classroom to teach them about the education, health care system and dietetic practices in each country. During their three-week exchange, students are exposed to the culture, food, major health issues that are affecting the country's health system, and dietetic education, training, regulatory, policy and practice standards unique to each country. Each year, the students have a great experience and I am very happy to be able to bring my students to Canada each year as a leader. This exchange program has operated for the last four years, and I hope it will continue for a very long time. The maximum number of students that can participate each year is six. From BUC, there were two students in 2012, six in 2013 and four in 2014. From WWU, there were three students in 2012 and in 2013 and two in 2014. An overview of the program to date was presented at the Women's Education Worldwide Conference in January, 2013: Increasing Collaboration and Cultural Competence of Students in Food and Nutrition Through International Exchange Programs. In lead up to this PEN@10 milestone, we have created a PEN® Community webpage where we have launched our storyboard video which shares our story of how we have grown to become a global resource for nutrition practice. Come by our page and watch our storyboard video. Kick-start healthy eating habits – cook more meals at home! These are the themes of this year’s Australia’s Healthy Weight Week (AHWW), an initiative of the Dietitians Association of Australia (DAA) celebrated from 16 – 22 February. Of course, we are also promoting Accredited Practising Dietitians (APDs) as the experts in weight loss and healthy eating advice. AHWW provides Australian consumers with nutrition fact sheets, including information sourced from PEN’s Food Skills Background. Our online cookbook and social media toolkit are available to download and use for free. There are more 350 events (the most since AHWW began in 2008) registered by APDs around the country, and DAA will be hosting a live Twitter chat on Wednesday 18 February, 8.00pm – 9.00pm AEDST for an hour of healthy cooking inspiration. Nutrition experts, cooks, foodies and health enthusiasts will join in the conversation with the official Australia’s Healthy Weight Week Twitter handle, @HealthyWtWk. Participants will be encouraged to hashtag their Tweets with #AHWW. Topic: Inspiring adults to participate in healthy home cooking and to choose the correct portion sizes. Who can participate? Anyone! The Twitter chat will be inspiring for people wanting to cook healthier meals in the New Year. 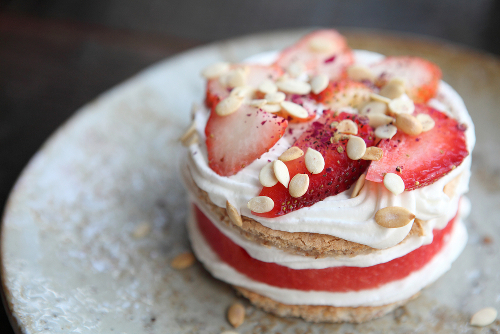 We also encourage nutrition experts, cooks, foodies and health enthusiasts to share their top tips. Are you new to Twitter? Check out our one page cheat sheet to help you get started. Unless you’re a heroin addict, you probably don’t need to detox. Here’s why. When we shared this story on our PEN® Facebook page, we had no idea it would become our most popular post yet, reaching over 72,000 people! Between this story, and a whole host of stories on detox, written around the world, we know this is a topic that dietitians continue to be asked about in their professional and personal networks. A recent review described detox diets as “short-term interventions designed to eliminate toxins from the body, promote health and assist with weight loss.” (1). Detoxes range from total fasting to food modification, with or without laxatives, diuretics, vitamins, minerals and specific foods. Detoxes and cleanses rest on the idea that the human body accumulates toxins due to exposure in the environment (pesticides, pollutants, plastics), in our food supply or from inadequate disposal of metabolic waste (2). In their review, Klein and Klat (1) outline a summary of environmental and food chemicals, as well as commercial detox diets designed to remove them. While evidence is lacking on the effectiveness of these diets (1,3), consumers remain curious about detoxes and cleanses. We know dietitians are working hard in the nutrition jungle to cut through the clutter of nutrition misinformation. We have all seen that when a poor quality diet is replaced with a diet that nourishes, feelings of improvement are often experienced. We have observed several dietitians respond to stories on detox diets in popular media, in social media and in blog posts, highlighting confounding variables that may explain the espoused benefits of detoxing or cleanses (Examples are here, here, here and here). We offer congratulations to all dietitians who share an evidence-based perspective that at times may be opposite to popular beliefs or perceived as unsexy. Talking with our clients and colleagues about detoxes and cleanses provides an opportunity to bridge back to healthful eating. “Sounds like you really care about your health” is one example of a neutral response in these kinds of conversations. Becoming curious about what is meant by the “cleanse” and “detoxes” can help provide a starting point for dietitians to build this bridge. To help you cut through the nutrition clutter of misinformation, we have pulled together 10 resources that can help you build your evidence-based responses to questions received around detoxes and cleanses. Evidence Clip – Is “Cleansing” Healthy? Ask a Food and Nutrition Specialist – Detox Diets: Do they Offer Any Health Benefits? Orwell S. Detoxes: An undefined scam: why you feel good during a detox. Jan 21, 2015. Available from http://examine.com/blog/detoxes-an-undefined-scam/). PEN® international working groups include dietitians with expertise to a specific topic areas from across all the partner countries who are working collaboratively to synthesize evidence for a practice area. Please take a moment to read and acknowledge your colleagues who have helped as authors, or peer reviewers for PEN® content as part of our PEN® International Working Groups. If you would like to be a PEN® author or reviewer, please click here to send us your contact information. How media spokespeople use evidence to boost their message.